Read coaches quotes and what others are saying about Coach's Office. I have been using Coach’s Office since 2006. This software program is the most efficient product that I have seen or used. The Chalkboard, Playbook, and Script Sections are very user friendly and have helped our staff tremendously in the areas of time management and productivity. I started using the drawing, scripting, and practice card features of Coach’s Office in 1997. It cut our practice preparation time by 70%, giving us more time to view video and work with our players. I have been around it since 2003, and it has been one of the most critical tools in the preparation process for me. Having easy access to formations, plays, defensive calls, etc. has been invaluable and incredibly time saving in my weekly preparation. The support from the Coach’s Office staff has been terrific – thanks for all that you do. If you are interested in working in professional football, Coach’s Office cutting-edge technology will take what you already know about the game of football and advance it to a new level. As the game of football continues to evolve with technology, students who learn to use Coach’s Office will be ahead of their competition. 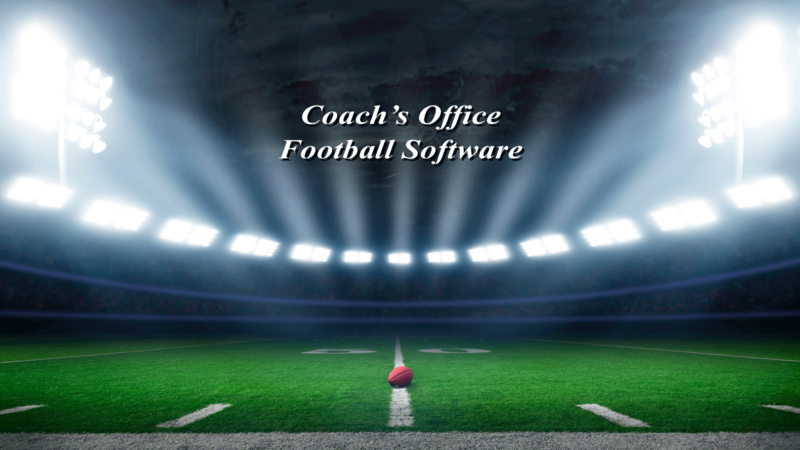 We require our ‘Football GM and Scouting’ students learn Coach’s Office, as it is the leader in sophisticated coaching software. In my opinion, Coach’s Office has no equal. It has allowed me to become a more effective teacher in the classroom and my linemen are smarter on the field because of it. I was able to present the playbook, created in Coach’s Office, to my offensive line using the slideshow. I don’t even want to remember how I used to do things. I can honestly say that coaches can also feel confident that they are not only purchasing a great product but a great relationship/partnership with phenomenal technical support that is second to none. Bottom line: Coach’s Office saves you time. Pre-season, you can create a playbook quickly using powerful drawing tools and pre-made templates. During the season, you can script and get cards drawn in minutes, allowing you to watch that play the 4th or 5th time and really get inside your opponent, as opposed to just seeing it once or twice. You will be a better coach and your team will be a better team because of this. As good as the program is, in my opinion, the reason to get this software is the outstanding Tech Support. Coach’s Office user since 2002. Interested in using Coaches Office – DO IT!!! It is totally comprehensive for practice and game preparation. You can have all your cards, scripts, QB wristbands, you name it! Thanks, Stan, for your support throughout all the years! With the addition of Coach’s Office, our practices and game preparations have gone to another level. I’ve been using Coach’s Office for years and my golf handicap has gone from 12 to 1. That’s worth the price of the software alone. This is the best software program I have ever been associated with. It has truly made a difference in our preparation quality and time management. Since 2004, the Coach’s Office software program has been a tremendous help to me and our staff. Both the Playbook and Script have saved us countless hours of preparation on a weekly basis. I would highly recommend Coach’s Office to any staff or program. I first used Coach’s Office at the University of Cincinnati and have never stopped. As an assistant coach or head football coach at any level, it has enabled me to prepare and use my time more efficiently without sacrificing attention to detail. The chalkboard, playbook, scripting, and wristband features have brought a complete method to tie everything together. We’ve been using Coach’s Office since 2001. What an outstanding program. We are more prepared and efficient for practices using the weekly scheduler, creating scripts, and drawing play cards. In addition, it has helped us compile our football notebook in a very professional-looking format. Equally important is the outstanding technical support that is always available. Being able to use Coach’s Office with the iPad has dramatically cut down on our practice prep time. This allows our coaching staff to be more efficient with our time, both before & during our practices. Our players are visual learners, and this is a great tool for them to comprehend it in a visual way, while increasing their repetitions each day. Coach’s Office has been an excellent tool for our football team. This is a user friendly program that has been instrumental in our preparation. Thanks to Coach’s Office for their continued technical support and service. We won 28-21 in the last minute of the German Bowl game. This was our first season using Coach’s Office for the offense, and I know it was a key element in our preparation each week. It saves time, is easy to use, and it works! In Europe, where a lot of coaches are part-time coaches, the software helps to save a huge amount of time. Preparing for practice becomes easier and faster. But at the same time, it is planned out to the smallest detail. The connection of all of its components makes it so special. What can Coach's Office do for you? You’ve read what Coach’s Office can do and what it has done for other coaches. Start using Coach’s Office today and find out what it can do for you.